Two years ago Emma and Mel moved to a house in Whitstable with a long thin garden. It’s open on May 19th 10am-5pm for the NGS. They came from a London flat with a tiny courtyard: ‘I’ve been dreaming about how I would create my own garden for years,’ says Emma. 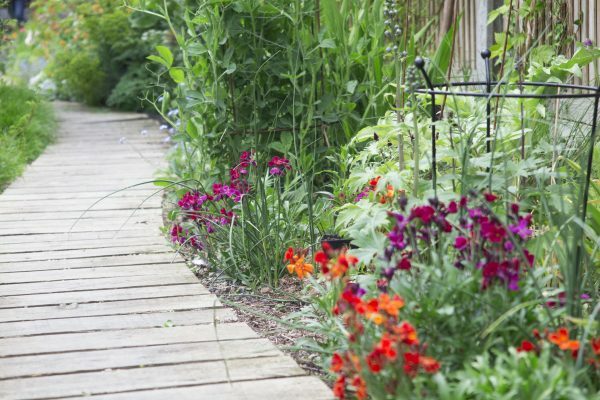 Mel and Emma have a colourful border on just one side of their long thin garden. When they bought the house, the garden was a long thin strip of decking, concrete and lawn, with one tree. It hadn’t been ‘gardened’ for many years. Mel and Emma contribute very different skills and talents to the garden. Like Harold Nicolson at Sissinghurst, Mel’s strength is structure and geometry: ‘I know nothing about plants,’ she says. Emma is a passionate and committed gardener. She left her office career to become a gardener when they moved out of London. Emma and Mel’s long thin garden seen from the other end. Planting is deeper at the top and bottom of the path, because it has a slight curve in it. Good gardens are a combination of good structure and planting. Emma and Mel decided to have a border on just one side of the garden. They ran the path to one side, too. If they had planted beds on both sides of the garden, the garden would have looked narrower. The lawn is also set to one side, rather than straight down the middle. So, that, too, helps the garden look wider. The path has a slight curve in it, to take it round the tree. So the beds at the top and bottom of the garden are deeper and fuller. Having two narrow beds down either side of the garden would have made it look even more long and thin. There is more about how to make paths work in narrow town gardens here. Mel and Emma say that inches count if you’re gardening in a very narrow space. 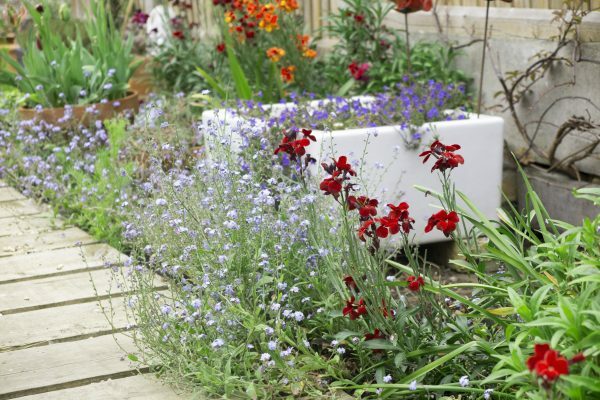 When they completed one of their raised beds, they realised it wasn’t in quite the right place – just by 12 inches. They dismantled the bed and moved it. 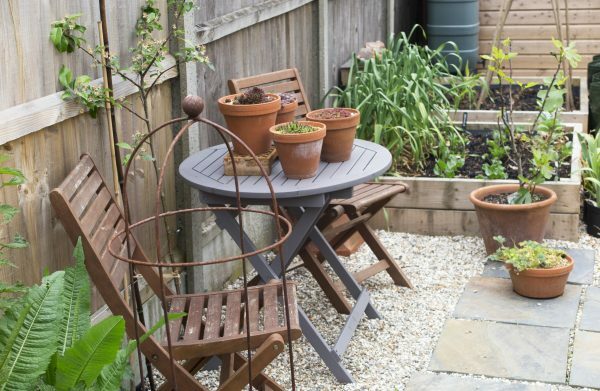 Raised beds for vegetables at the bottom of the garden, plus a charming seating area. Mel and Emma have a large terrace, a path, full borders, a lawn, a newly dug pond, a meadow area, a vegetable patch, a greenhouse, a shed and wildlife area. Yet the garden is just fifteen foot wide (four and half metres). 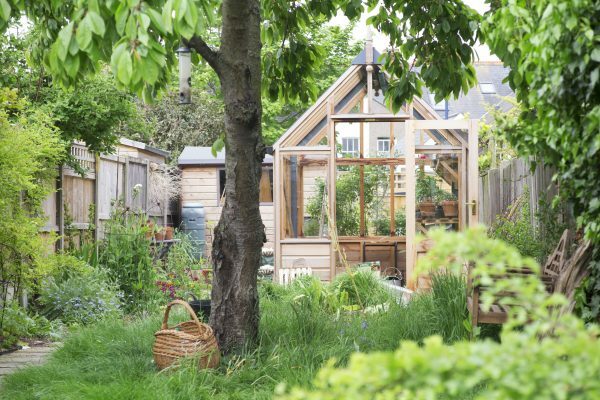 The greenhouse is towards the bottom of the garden and set to one side, so that you can see past it. The meadow area and wildlife pond is just in front of it. Emma uses a bulb planter to plant the meadow plants in the grass. 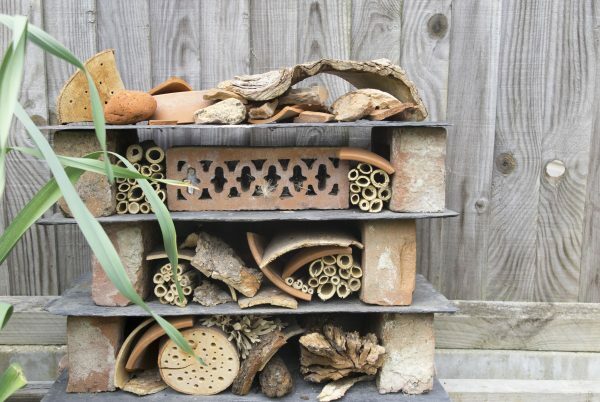 Their bug hotel straddles two raised beds. There’s a sense of unity in the hard landscaping Mel and Emma chose. They have a fence, path, terrace, greenhouse, gravel, raised beds and a shed, all in much the same bleached-out tones. In a narrow garden, it would look bitty to have too many colours in the path, fence and sheds. Mel and Emma have lots of different materials. But almost all are similar in tone and colour. Although they got rid of the large expanse of decking, they chose a deck path for the garden. It looks harmonious with the fencing. The bleached wood is also echoed in the greenhouse and the shed. The decking path is harmonious with the fencing. Because the garden is long and narrow, the path is close to the fence, which is why thinking about the two together is important. Create places to sit throughout the garden. So there’s the terrace outside the back door, a bench halfway down the garden to one side and the little seating area at the end. There’s a terrace directly outside the back door, with a seaside theme on the table. And a bench on one side of the garden, to take advantage of the shade under the tree. It’s surrounded by a small patch of ‘meadow’ grass. Divide a long thin garden up into ‘rooms’. That is the standard garden design advice. And Mel and Emma have chosen to do this, but to do it very lightly. The garden is divided up by different planting, benches or hard landscaping rather than by fences or hedges. ‘We decided not to divide the garden up with hedges or fences,’ said Mel. Mel and Emma have divided their garden up almost ‘invisibly’. So the greenhouse divides the raised vegetable beds from the rest of the garden, but you can still see through. Changing from lawn to meadow divides up the long thin grass area. Mel and Emma have been generous with the size of the terrace outside the back door of their house. When space is short, it’s tempting to try to save space, by making the terrace just large enough for a table and chairs. But a generous terrace starts the garden off with a flourish. And it also means you have room for furniture and pots. There’s a table, chairs and lots of room for pots on Mel and Emma’s terrace. Container planting and pots work well in smaller gardens to create more structure and interest. Mel and Emma have wonderful pots all around the garden. And you can also move pots around to change the area of interest. For example, when a pot is in full flower, you can move it to a prominent position, and then when it is over, it can be moved out of sight. The seating area at the bottom of the garden has a little table with pots on it. Pots are also useful because you can move them around for different effects. An old sink is set into a border. It looks great surrounded by flowers. Many top garden designers now work on typically long thin town gardens, in cities – especially London. 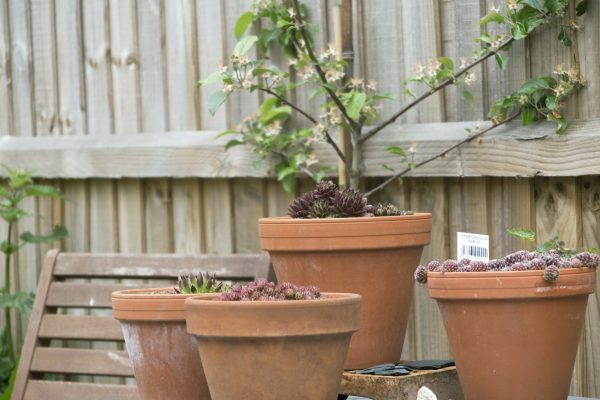 We’ve interviewed several on the Middlesized Garden, and they’ve had some great tips for us ‘ordinary garden owners’. 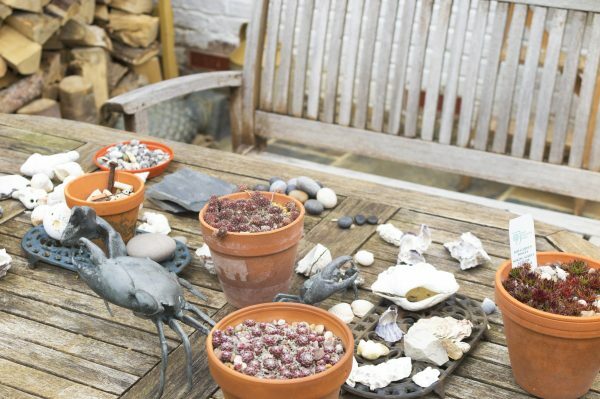 For example, Charlotte Rowe, a RHS Chelsea Gold-medal winning gardener advises the owners of small town gardens to use ‘a limited palette of plants.’ Find out why in her 12 creative tips for a stunning urban garden. In Faversham (near Whitstable), 20+ ‘ordinary’ gardeners open their gardens on Faversham Open Gardens and Garden Market Day. There are some very practical and effective narrow town garden ideas here from some of the gardens that participate or have participated. You can even have ‘an orchard’ in a small town garden. Here are more design ideas from four private gardens that are never open to the public. Although the gardens are larger, the ideas would adapt beautifully to any size or shape of garden. And dates for your diary! 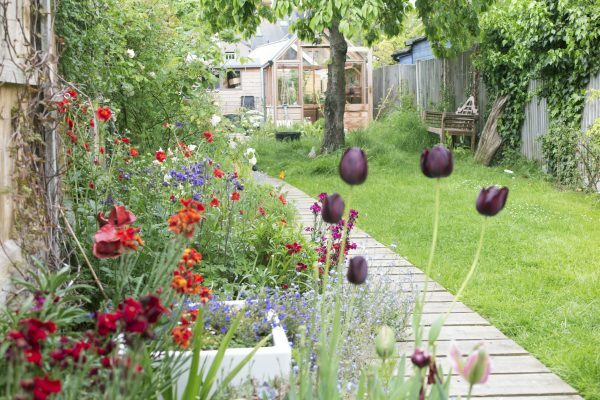 Whitstable Open Gardens is on May 19th 2019 and is run by the NGS. And do come to the Faversham Open Gardens & Garden Market Day on Sunday June 30th 2019. 12 comments on "8 steps to the long thin garden of your dreams"
I don’t understand this article… it states “facts” about this particular garden, but i have no idea on how to apply those to my garden and why. Example: the plantin is deeper at the top and bottom of the garden… is this intentional to create a certain effect or is it just forced by the circumstances?! Or use pots to move around…. How?! where? why?! I’m sorry, the ‘pots’ part contained a typographical error, thank you for pointing it out. 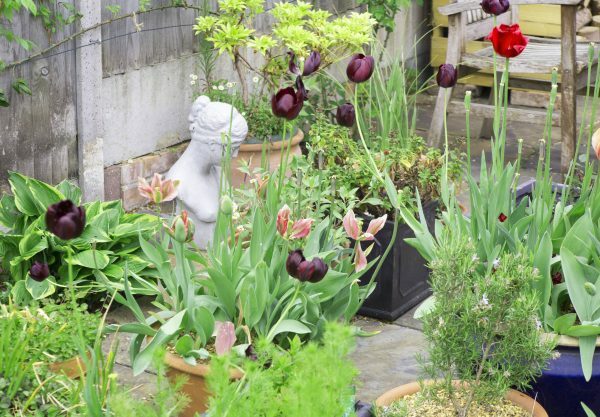 It should have read to ‘move pots around…’For example, when a pot is in full flower, you can move it to a prominent position, and then when it is over, it can be moved out of sight. The borders and planting are deeper at the top and bottom of the garden because this helps to distract the eye from a long thin shape. 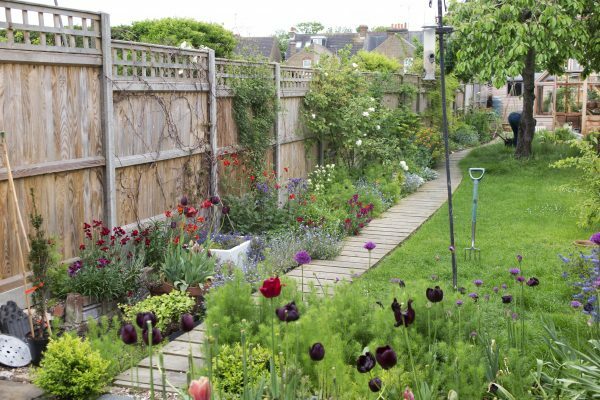 If you have a long, thin garden and you put a narrow border all the way down one or both sides, then you accentuate the shape. 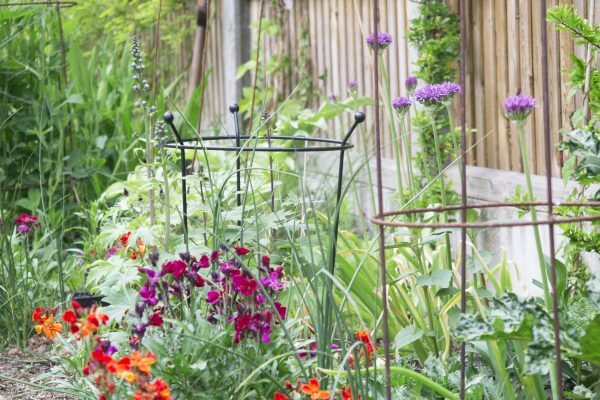 But by creating a wide border (across the garden) in one or more places, you can disguise the shape and make the garden look more lush. I hope that helps. Impressive how the small space was turned into such a nice garden. I would love to apply some on my own place too. I also love gardening, me and my husband do it to bond and if there is a chance, we would love to be part of different gardening events too. Please check our garden online too @ https://www.gardenloka.com/. Thank you – and I like your heritage tomatoes post. This is the pure art of gardening. After seeing the pictures in above blog and reading Emma story, I think she made right decision to leave the job and pursue her gardening passion. Well-done! I’m too far away to see it, but I wouldn’t hesitate if I lived closer. They’ve done a wonderful job. It’s truly lovely. Glorious photos and great advice which made me want to go straight outside to do something more creative with my own patch. 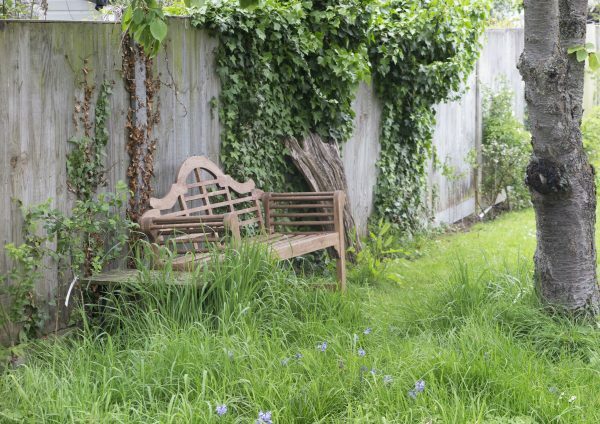 I’m also just trying to plan a (virtually ) no maintenance garden area around 4 yards by 4 yards outside a West London terrace split into 4 flats, mainly tenanted, with a front area that until recently was a haven for rubbish, weeds and rats. We’ve now cleared this but have a flat, bare-looking square of tarmac at ground level, steps down to a small basement area and a broad path up to the front door where there are a few pots of ailing, unkempt outdoor yuccas. None of the four flat owners has much time for plant care as they are often away but some light watering/pruning every week or so is certainly possible. Next door has a mini olive grove emerging from beds covered with what looks like shards of slate to deter weeds and this looks pretty smart – she has also had a solid wooden fence built to screen the horror that was our area, so we are now guilt-ridden and looking to prove that we too can install something low maintenance but tasteful. Any bright ideas for what we could do? It’s an interesting challenge – I will mull it over, and do a post on low-maintenance gardening. What a lovely post! Lots of inspiration and practical ideas here, and great photos. Sadly, we are miles from Whitstable, but I’m sure people will appreciate all the thought and effort which has resulted in this delightful garden. Now, where can I put another seating area? Thank you! And good luck with another seating area, maybe move light garden chairs round the garden to experiment before deciding?